Though not the largest of horses nor the fastest over short distances, the Arabian is surely the most beautiful of breeds. Look at the proud arch to the neck, the large, deep eyes, the fine head and delicate muzzle. The legs so long and lean look fragile and easily broken and yet the Arabian was bred for strength, courage, endurance and intelligence. It was bred for speed, bred for battle and bred for companionship. Arabians originated in the Arabian desert. The Bedouins who skillfully bred selectively to lock the key traits of Arabians into the breed have truly bestowed upon the world a living work of art. On top of that, most of today's horse breeds can be genetically traced back to show Arabian ancestory. Though not as fast over short distances as a modern Thoroughbred, nonetheless all of today's Thoroughbreds stem from three fine Arabian stallions, the Byerly Turk, the Darley Arabian and the Godolphin Arabian. Without this strong foundation the Thoroughbred would not be nearly so magnificent as it is today. Many misconceptions cloud the Arabian's reputation. Primarily that they are hot-blooded and difficult. In fact, as the original horses travelled with the Bedouins and prize mares often were sheltered in the tents with the women and children, gentleness was a treasured attribute and Arabians have a definate affinity to mankind. A survey of Arabian owners conducted in 2002 uncovered a surprising result. Most owners of these beautiful creatures were not involved in showing or competitions. Rather the majority of owners used their Arabians for recreational riding and family activities. Furthermore, when asked what events they would be most interested in seeing more of 64% said that they wanted more recognition for novice and amateur riders, which rather belies the belief that Arabians are hard to handle and only for the more experienced handler. 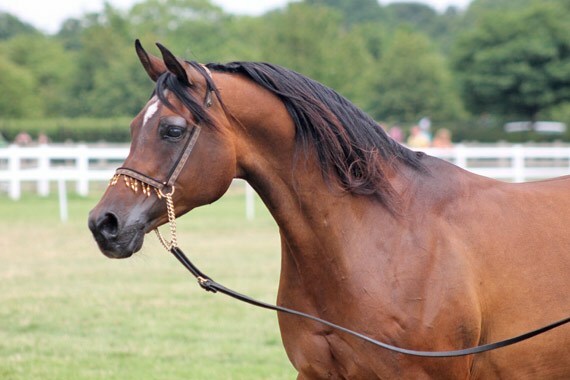 So, if you are looking for a horse and grace, beauty, endurance, intelligence and gentleness factor into your requirements look no further than the Versatile Arabian. Many thanks to John Tanner of Serr'raa Arabians for permission to use the photograph of his classically beautiful and versatile gelding Trouble 's Legacy. The Black Hills Wild Mustang Sanctuary is a non-profit charity dedicated to provide freedom for unadoptable and unwanted mustangs. the group also fund research into wild horse management.